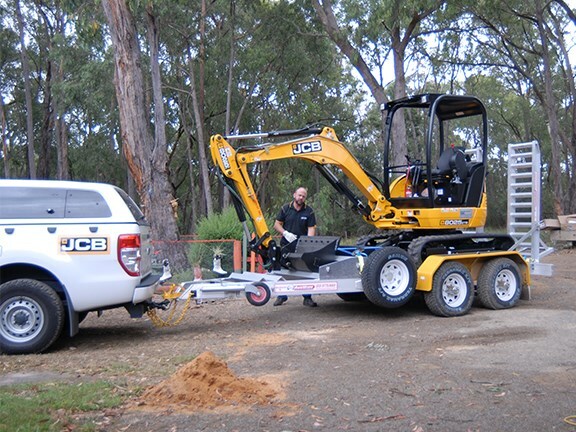 JCB’s Brendan Clarke and safety speaker James Wood with the modified 8025 ZTS mini excavator. 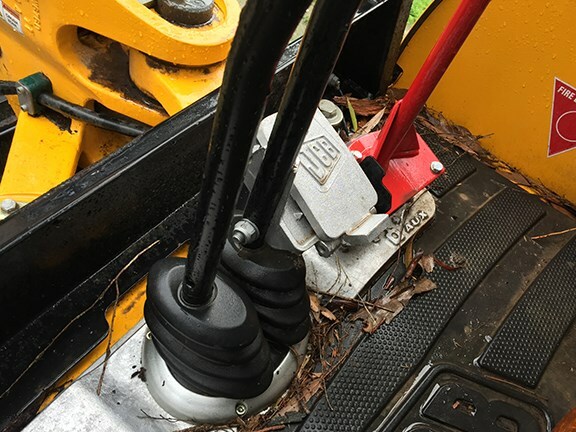 Detail showing the JCB 3CX backhoe loader stick attached to the JCB 8025 ZTS slew foot control. The JCB 8025 ZTS excavator is a little different to operate, so it has been safety-stickered accordingly. 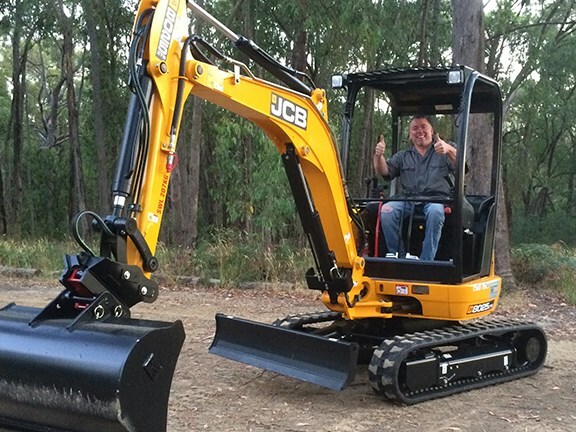 Brendan Clarke delivers the modified JCB 8025 ZTS excavator. 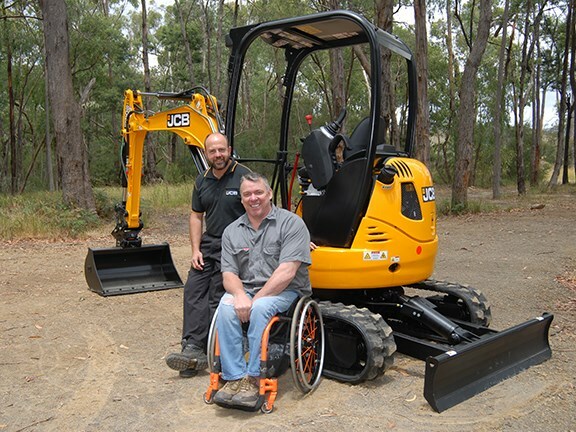 Paraplegic James Wood says he’s really impressed with the modified JCB 8025 ZTS excavator. It was a normal day by anyone’s standards. James Wood had recently finished his apprenticeship and was working as a diesel mechanic on a mine site when he got into a truck and headed down the road on a run-of-the-mill trip he’d done several times before. But this time the road was wet. 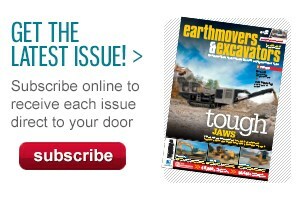 "I looked at the time since it was close to smoko and I was keen to get back to the lunch room, and put my foot down a little bit," he tells TradeEarthmovers.com.au. "I was going a little bit too quick for the conditions, lost control and rolled the truck down the side of a hill." He wasn’t wearing a seatbelt. James was thrown out and broke his back — a spinal cord injury. He was airlifted to hospital, where he spent the next three months, followed by a six-month stint in a rehabilitation centre and a life bound to a wheelchair. "After the accident I struggled with what I was going to do workwise," he says." I couldn’t go back to fixing trucks and machinery so I stuffed around for a few years and then got asked to share my story at a workplace and have pretty much been doing that ever since — I talk about workplace safety and what happened to me." While James is a very friendly and positive bloke who’s making the most of his changed circumstances, there are some things he just can’t do for himself while living in a wheelchair. "When something like this happens you have to rely on other people a lot more, and that becomes frustrating," he says. "So I’ve always thought, well there have to be ways I can do a lot more of these things for myself." One of those things is operating an excavator. JCB CEA compact product specialist Brendan Clarke shows the red modified slew lever on the 8025 ZTS. For the past 12 years James and his wife Vanessa have lived on a 4-hectare property in Victoria’s beautiful Yarra Valley — a property that, like any other, needs constant upkeep. 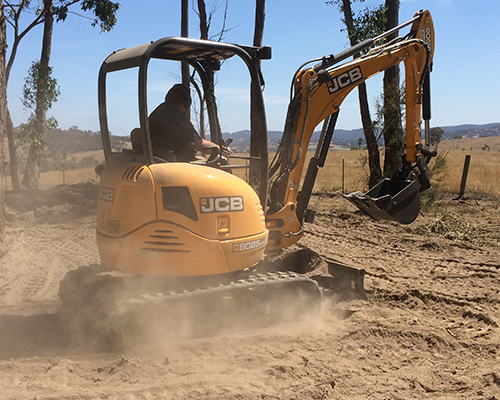 "One of the problems of living on a 10-acre property is that we’ve always had to rely on other people to do any sort of earthmoving, clearing or other excavating work," James says. "Because I used to fix this type of machinery I thought, well there’s got to be a way I can actually operate it as well." 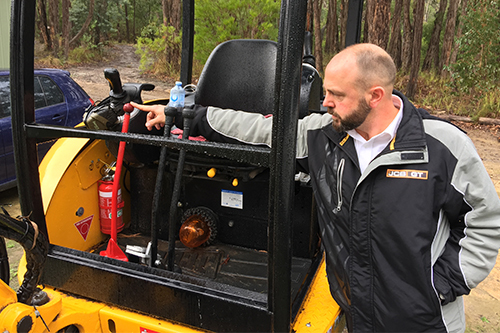 He shopped around, checked out a variety of machines and finally settled on a 2.8-tonne JCB 8025 ZTS (zero-tail-swing) mini excavator after speaking to JCB CEA compact product specialist Brendan Clarke. Trouble was, the JCB has a boom slew pedal that was impossible for James to operate so he and the team from JCB CEA had to work out some sort of modification that would allow James to safely operate it. In the end they constructed a lever that comes off the foot pedal so James can operate it by hand. It was modelled off a stick control from a JCB 3CX backhoe loader. "For a start, I’m really impressed with the machine," James says. "I did do a bit of shopping around with other manufacturers, but the reason I went with JCB was that they were willing to work with me to come up with a way of modifying the machine to suit me. "Brendan and I had a couple of meetings and worked out what may or may not work," he says." I made some suggestions, he made some suggestions, and we came to a happy compromise. Now I’m happily digging away on my property." Brendan says this was a first-time request for JCB CEA, so it needed a lot of thought. "We obviously looked into different OH&S obligations from us and whether the modifications would cause damage to the machine or damage to an operator," he says. The JCB team talked about things like locking on hydraulics or unlocking hydraulics, and went through a variety of options to work out if it could actually be done. In the end, in some ways it was an easy fit, Brendan says, as the company has resident people to manufacture modifications. As the slew of the boom has been brought up to hand height instead of being operated with a foot pedal, the machine is a little different to operate. With this in mind, JCB did an in-house plant risk assessment, and the modification was noted and safety-stickered accordingly. 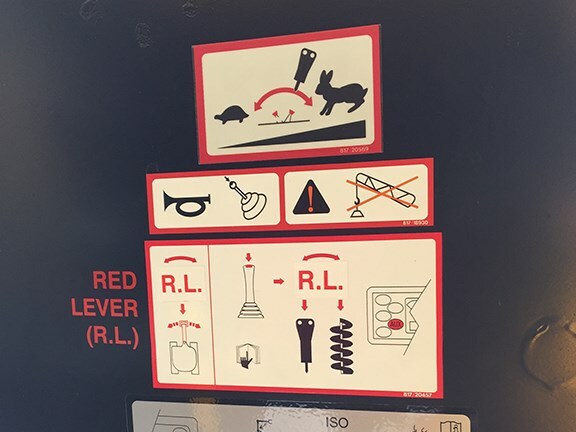 "When we did the handover Brendan spent some time going over the safety aspects of the modification and showing me the warning stickers that they had made up especially for the modification," James says. Depending on the job, not being able to operate the slew while using the other hand controls could be limiting from a production point of view. However, James says that’s not a concern to him as he’s not operating the digger commercially. "After we did the initial modification Brendan suggested that I just use the machine for a while to see if there was anything else that should be modified," James says, emphasising that JCB didn’t just drop the project as soon as they’d handed over the machine. "For example, I can’t climb on and off of the machine — I have to physically lift myself. So Brendan and JCB said, ‘Look, if you need a rail or a handle we can attach it to the machine to suit you." In the end, that modification didn’t get done. What James has done instead is to dig a depression beside a concrete path so the excavator floor is lowered to a point where he can pull his wheelchair up alongside it and lift himself on to the floor. "Because I’m the only one using the machine I can modify it any way I like," he adds. The modifications James and JCB have made are not permanent, which means that, when the time comes to sell the excavator they can have the machine back to standard configuration in an hour or so. James Wood has done 50 hours on the modified JCB 8025 ZTS excavator so far. James says it’s been really easy to get to grips with the machine as a relative novice, though it has taken him a little while to get his head around it. "The interesting thing is, I worked on this kind of machinery for years and could operate it from a maintenance point of view but actually operating it efficiently from an operator’s point of view is a whole different mindset," he says. "I mean, I knew how to move the machines, how to turn them, but to actually dig a hole or to clear a piece of land properly … it’s like a work of art. "I’ve got a whole new respect for operators. I used to abuse them for stuffing up the machines but now I think, ‘You know what? They can do something that I’ve never been able to do!’ "
James says YouTube has been a valuable training resource, as has a mate who operates machines for a living. "I’ve done 50 hours on the machine so far," he says "And I reckon 40 of those were mistakes! But I’m getting there …"
Turning back to James’s great work in occupational health and safety, Brendan says he engaged him to talk to the team at JCB CEA’s Melbourne office. "He conducted a couple of safety training sessions for all our field and sales staff, which was very good. That was part of the deal as the price was very sharp," Brendan says, to a roar of laughter from James. "Vanessa runs the business and there’s a guy, Alan Newey, who lost an arm to a conveyor belt, and another lady, Michelle Rath, who lost a son in a workplace accident and who shares her story from a family point of view," he says. Rounding out the team is Anton Guinea, who received flash burns while working as an electrician. "The reason I travel around Australia and overseas is to tell people what happened to me, James says. "I try and give people a bit of insight into what it’s like to get hurt at work. "The reason I do it is that this is the kind of thing I’d like to have heard," he adds. "If somebody had turned up at my workplace and said, ‘Look, this is what happened to me, don’t let it happen to you’, that’s the sort of information that would’ve gotten through to me." 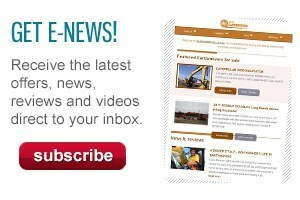 Click here to find JCB excavators for sale. Click here to look up JCB excavator specifications.